Hello amazing Friends! My boys are starting back to school today in their new schools and it will be mighty quiet around the house, so I am grateful to have this happy place to retreat to! 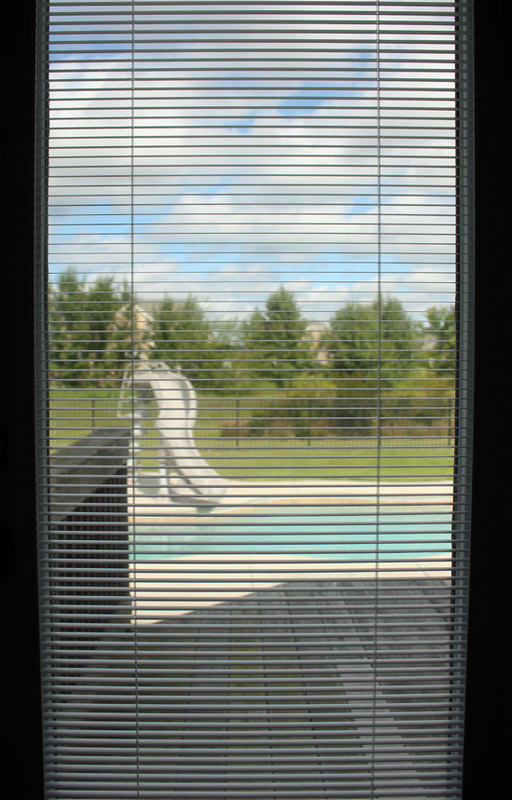 Today I am revealing the first completed space in our new house! I’ve included a few affiliate links so you can find the products I used. Our home was in pretty good condition when we moved in. If I had any complaints at all it would have been about this bathroom. I could see that there had been some sort of gate up at the doorway and I am guessing it was to contain a pup or two. The base mouldings were chewed and the grout was almost black. 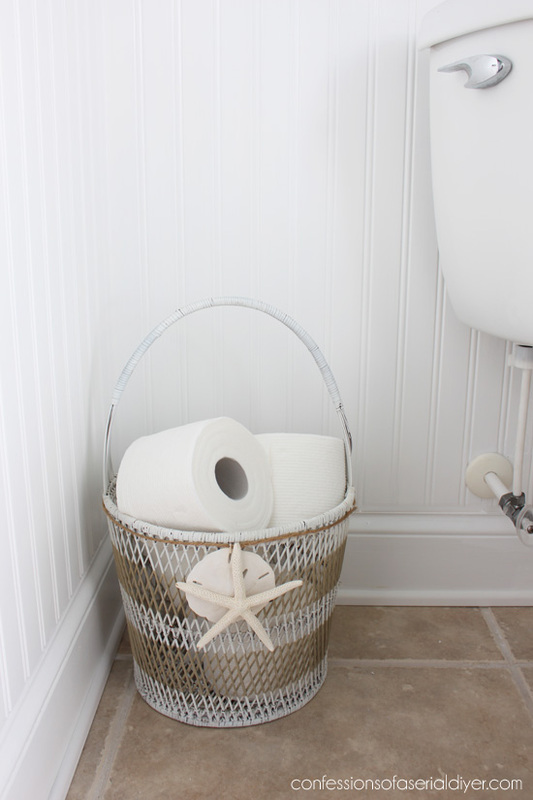 I knew I wanted to tackle this space as soon as possible, especially since this is the bathroom guests would use. I couldn’t wait to say goodbye to the burgundy! I’m so glad he did, I love the mix! I kept the décor in here really clean and simple since the walls add a lot of personality already. Remember this little caddy I redid a while back? We found it in my Hubby’s Grandma’s shed. I had taken it to my shop and ended up going back and getting it. After painting the vanity, it was time to paint the walls. 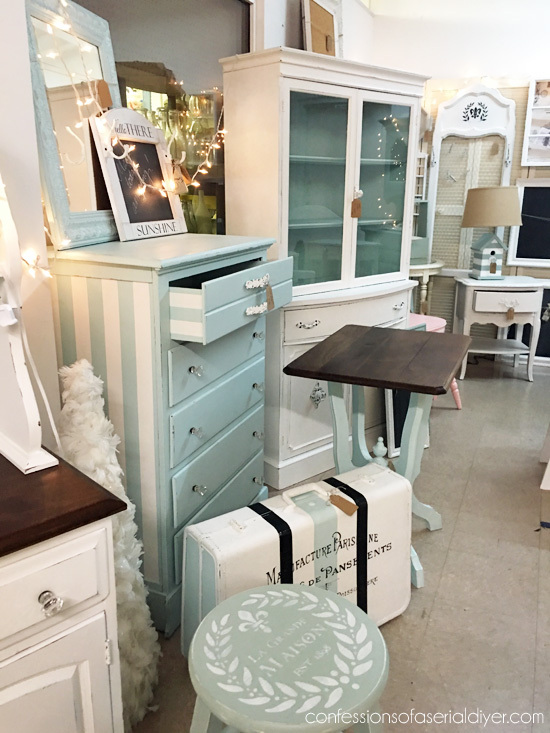 I loved the color of that little caddy so much, and I have painted several other things with the same color so I knew I wanted to use it in this space also. It is Sunken Pool by Behr. It is almost the same color as our pool! Then I added the wainscoting. I have always been a huge fan of wainscoting. I added it to the bathroom and kitchen in my first house, to my kitchen island in our last house, and knew I wanted to add it here as well. I found this at Home Depot. It comes in 7″ wide, 8′ lengths that I cut in half to make 4′. You can find them HERE. They fit together in a tongue and groove application. That door leads to the back deck and pool. It has been great being able to come right into the bath from the pool! It was a thrift store find before my spray paint and I found it. See more of that makeover HERE. Since the boys’ bathroom will be boyish, and our master doesn’t need a shower curtain, I took it upon myself to go all out girly on this one. And remember I said the grout was almost black? 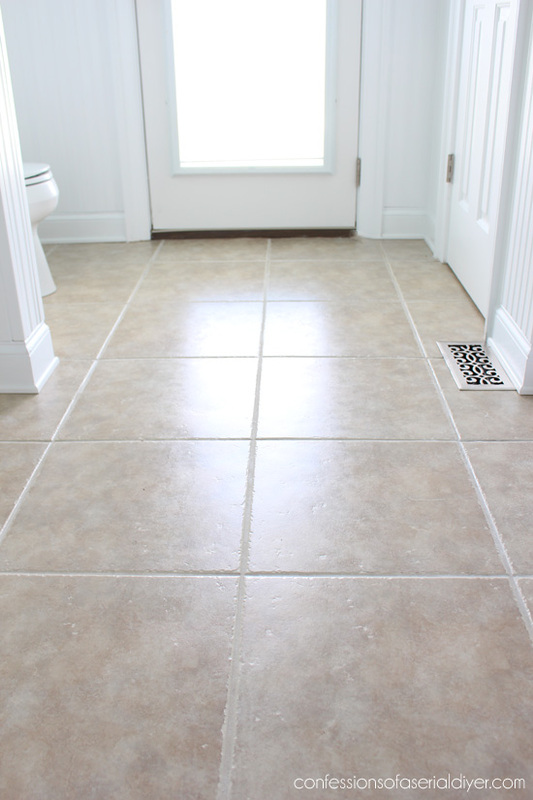 I originally bought a grout cleaner at Home Depot but reading the label made me think twice about using it, so I searched online for a less toxic solution and found several recommendations for a mix of hydrogen peroxide and baking soda…winner!! It worked fantastically… without me having to wear a hazmat suit, always a bonus. I bought some grout sealer but still need to do that. 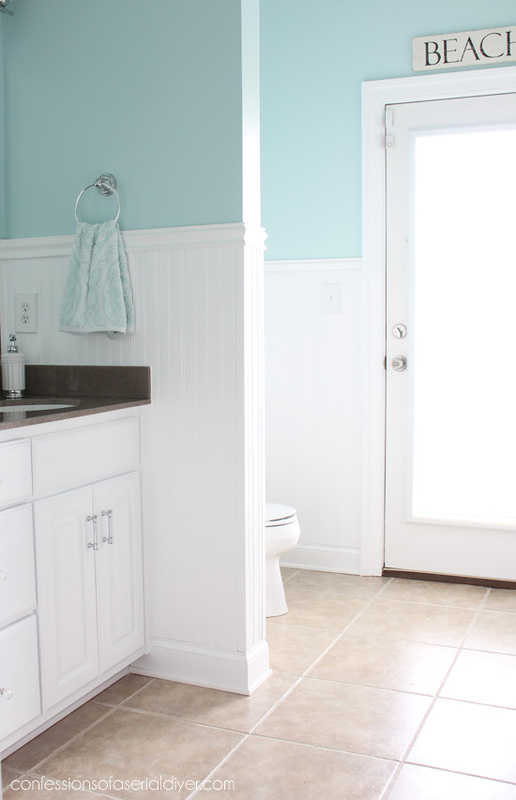 Overall I am so thrilled with how this bathroom came out! I love the light airy feel it now has. So that’s a wrap on my first completed space in our new house! 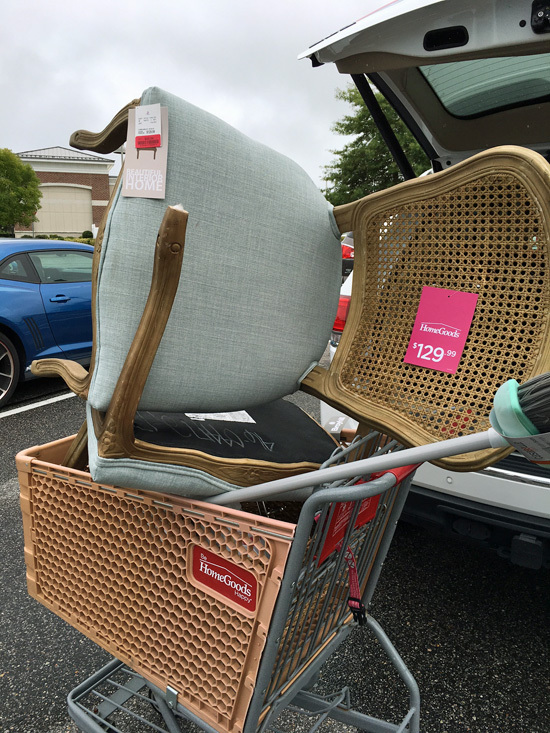 UPDATE: See how these chairs turned out HERE now! 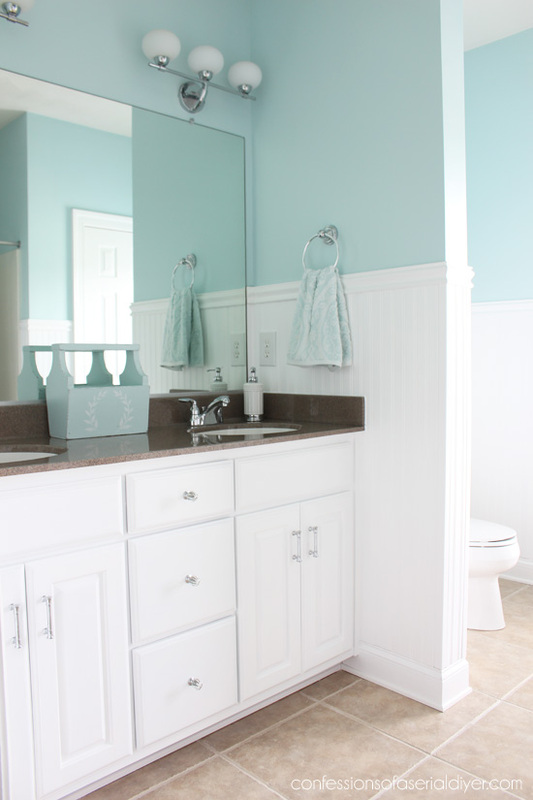 I Love how your bathroom turned out, it is so bright and beautiful now. How exciting for you to have all new rooms to decorate and to re-do. Your first re-do is beautiful. Can’t wait to see more. 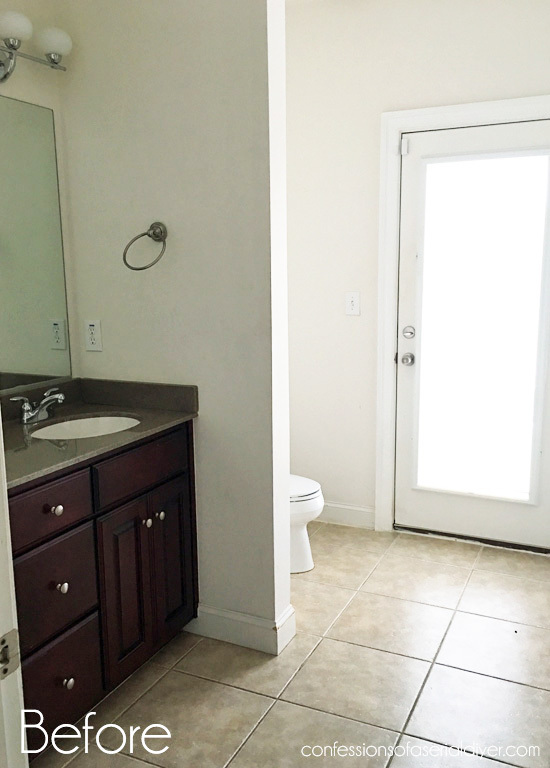 Oh Christy, your bathroom is a stellar makeover. Thank you for the truly transformational tip about the grout. Man you’ve been busy but the end result was so worth it I’m sure. Love the colors and the light and airy look. Fantastic job. Beautiful! Would love to see the tutorial too. 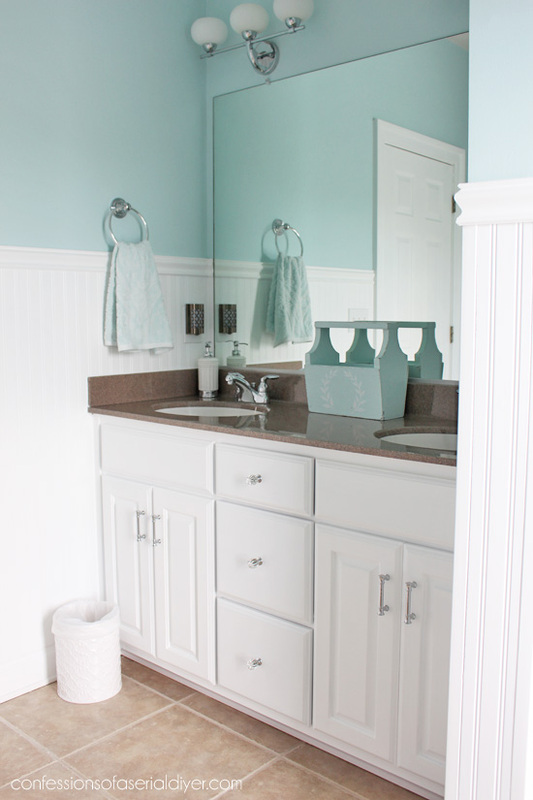 This bathroom is seriously transformed!!! Great job! I love the beadboad ! I have it in my bathroom too! 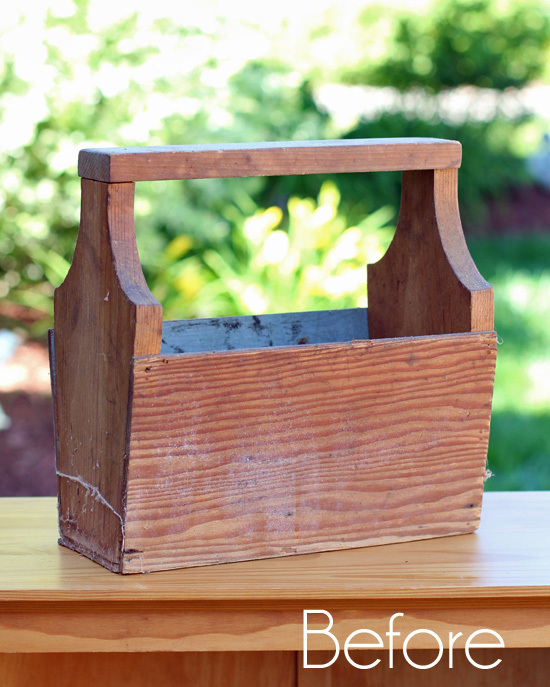 Also made a tray out of the scraps! The bathroom looks great!!! Love your new house. 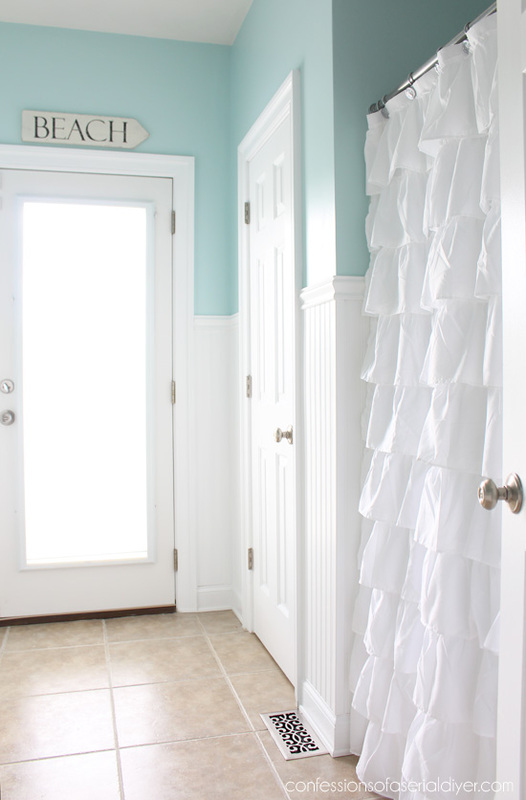 How do you install the wainscoting? It really looks great! Very nice re-do, as always! 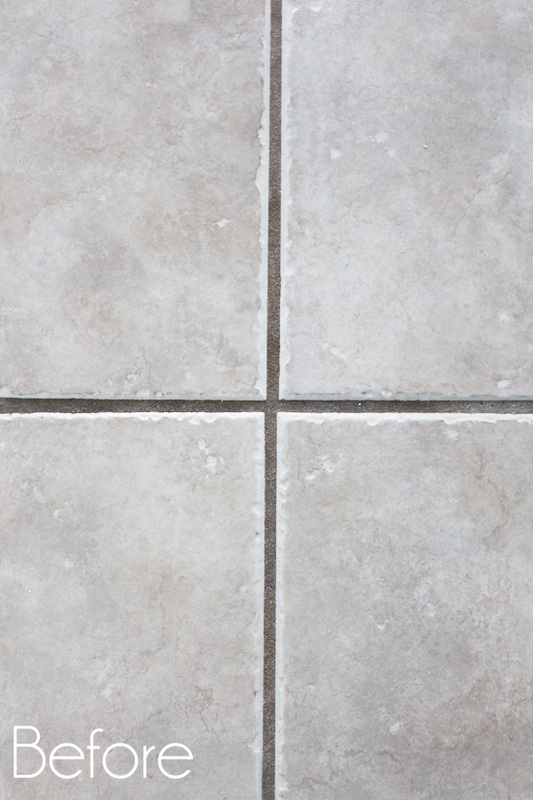 I am going to have to use your grout cleaning method on my kitchen – huge difference. Wish the grout cleaning fairy would do it for me LOL! I have no idea where you find time to do all this! Amazing room makeover. I would love for you to come and do over my bath;,when you find the time. haha:) No seriously you are such a motivator for me. It is like a sunshiny summer breeze just blew in! It is simply lovely! I would love to see a tutorial on how you did the wainscoting. It really transformed those blank walls and I’ve got a guest bath in desperate need for that same change. I really get excited to see the things you do! Thank you for sharing! I would love a tutorial on how you did the wainscoting!! This is BEAUTIFUL! Amazing what a little paint, elbow grease, and accessory updates can do for a room. And thanks for the tip on the grout. Regular mopping hasn’t helped keep mine clean at all, so I can’t wait to try this. Really like the guest bath transformation. It is a beauty! 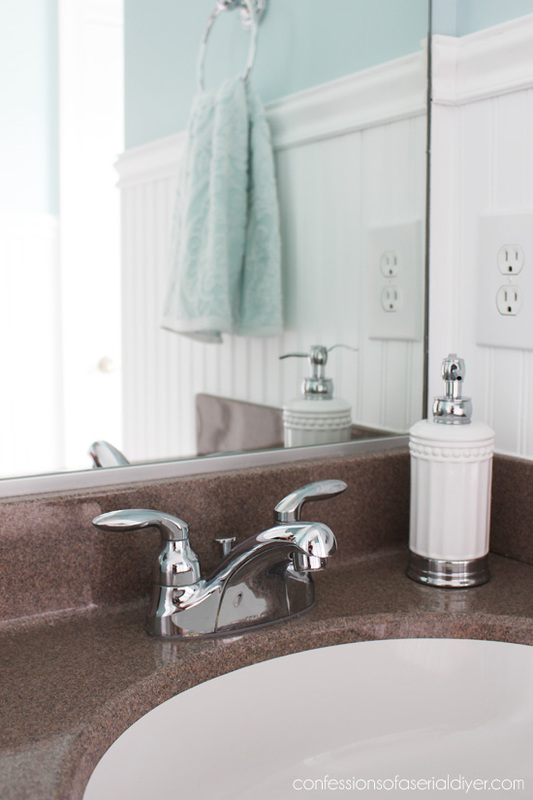 I would love to read about the beadboard installation as I have plans to do the same in a 1/2 bath makeover to cover up some dry wall issues where we removed a door and its frame. Thank you! It looks fabulous! We used the beaded board to in our bathroom. I love it and it was easy to put together. 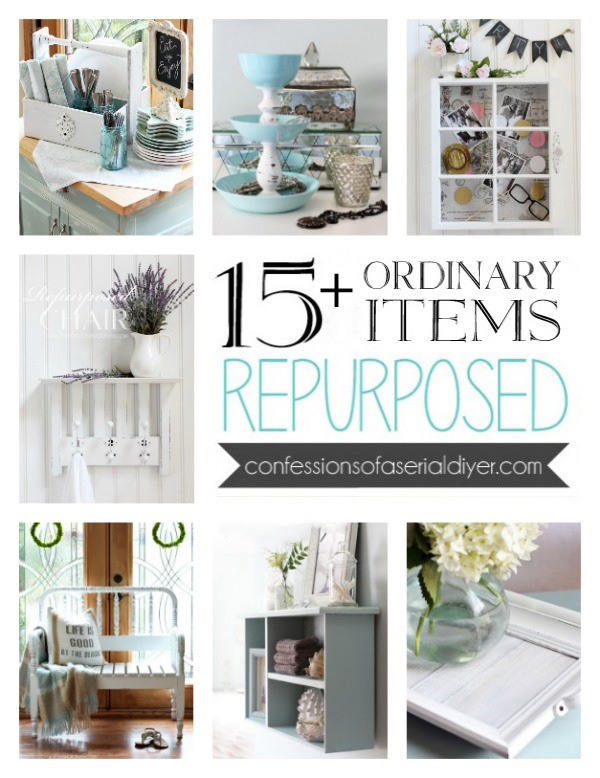 Love all your thrifty objects too. They fit right in! Hm, baking soda and peroxide…I need to try that! Yay for one room finished! Love your new bathroom! Perfect for a poolside bath. Thx for sharing your talents! YES! Would love a tutorial on the wainscoating! And your bathroom looks awesome. I want to know how you have time to do this after just moving into a new house!!!! You are amazing! 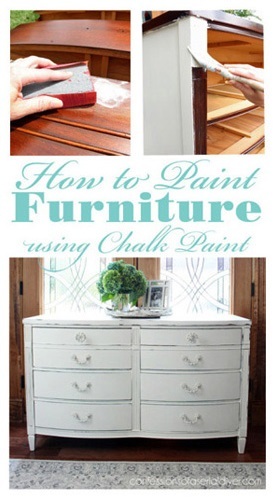 Yes please do a tutorial on the wainscoting! Did you bother painting the walls all the way to the floor since the wainscotting would be going over top, or did you only do partway? I plan on doing the same in our bathroom. I love your bathroom! So bright and cheery now! Thank you for the tip on the grout. You are so amazing! I love your creativity and everything you do. You should do workshops! I would really like to know how you do the wainscoting. Can you create a tutorial. If I send you photos of a couple of my “cookie cutter” home would you make suggestions on how to update it….PUHLEASE!!!!!! 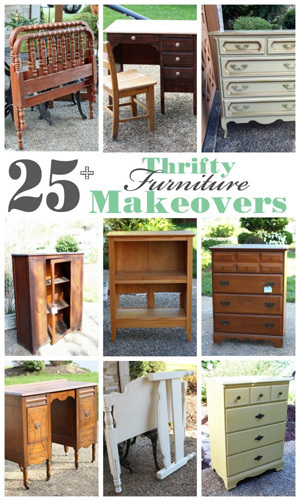 This is a fantastic makeover! 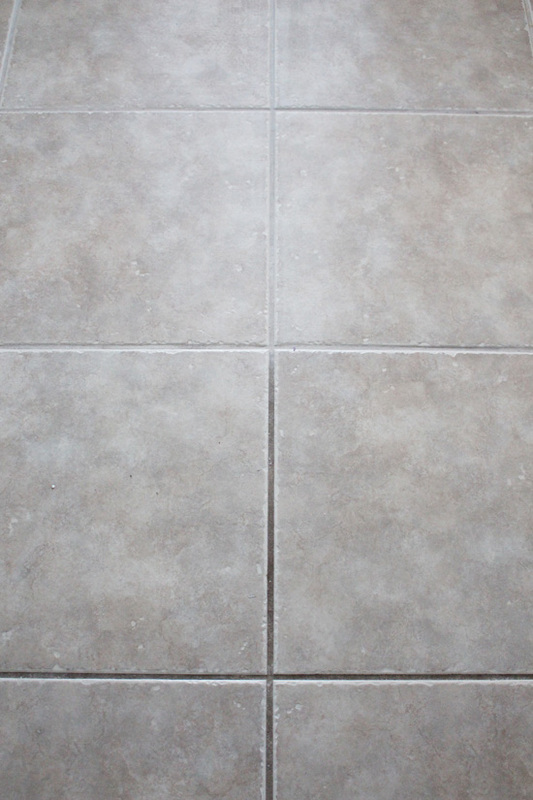 Good tip about cleaning the grout…inhaling chemicals is never a good idea. What a difference, Christy! You worked your tail feathers off by the looks of it. It’s so bright and fresh looking, especially with the addition of the white wainscotting paired with the soft pretty wall color. 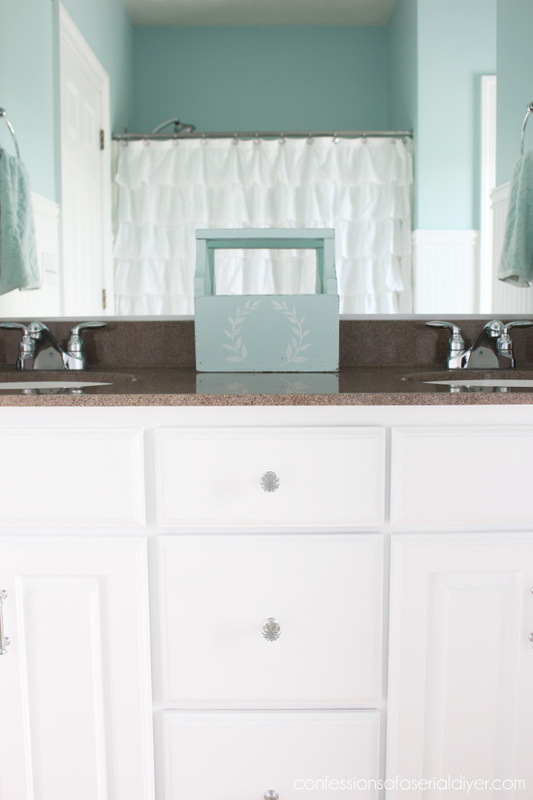 Love the hardware on the vanity too – good choice Brennan! I am so trying the grout cleaner (we used the chemical base one last year and it didn’t work near as well as your natural version seems to have). Christy, I love the choice of light blue. 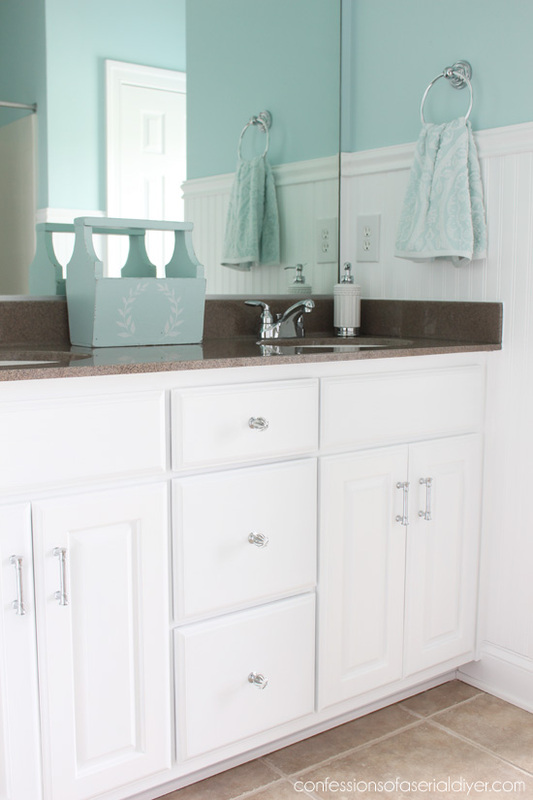 Not only does it match the current header of the blog, but it makes your bathroom look so much cleaner and friendlier. White or beige can really look clinical, but if I was a guest in your home and used this bathroom I would probably be jealous I didn’t have it myself! You probably said this a million times in the makeover and I scrolled through several times to find it to no avail. What is the beautiful blue color in the bath? For some reason the scrolling through your posts is really sloooooowwwww and jerky so please save my sanity LOL I have to say my mouth actually waters like when you see an awesome dessert every time I see your posts. Fabric and color does that to me and that’s how I can tell I really love something. Like everything you do. Love the wall color and all the cute accents. I laughed when I saw that the bathroom was your first makeover. Not the kitchen. Not your bedroom. Not your office. The guest bathroom. Wowee wow, what a great job! Aside from the fact that it’s huge, it’s simply beautiful now – beachy and bright (and clean 😉). 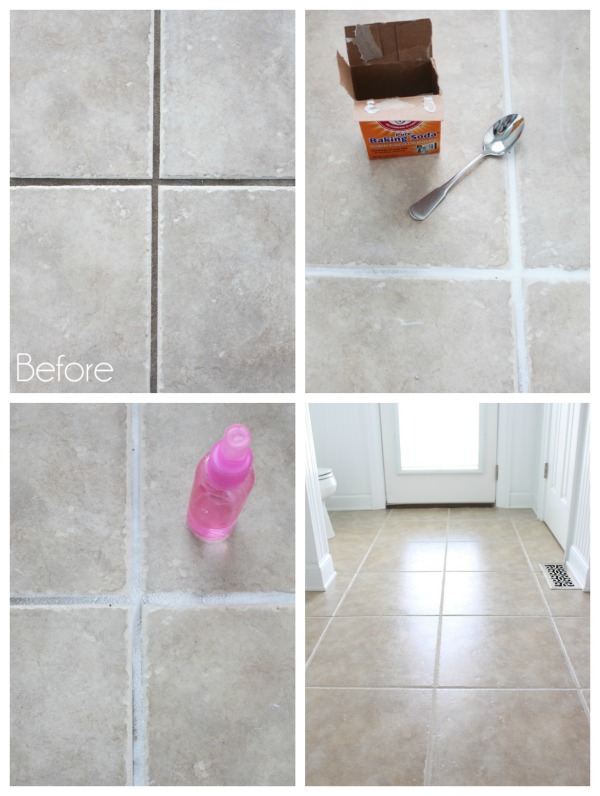 Great tip for the grout. I’m aching to paint my kitchen cabinets, but it’s a huge job. 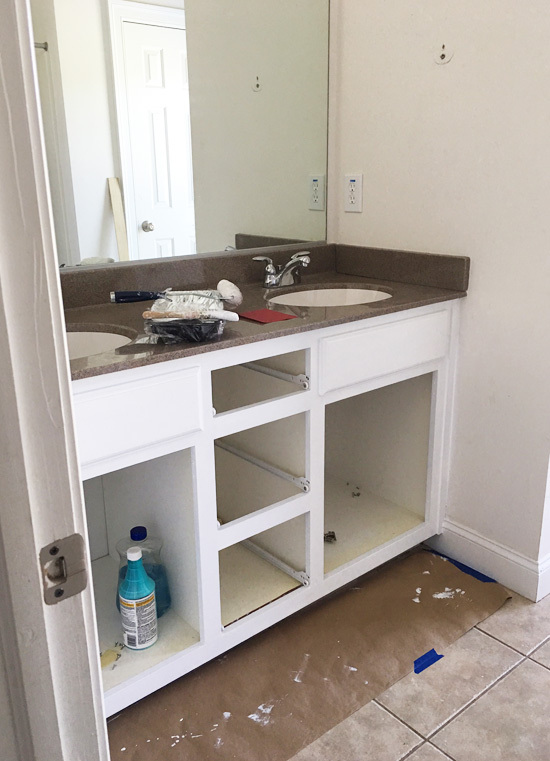 I’m going to do the bathroom vanity and see if it turns out as great as yours. Thanks, as always, for the inspiration. Looking forward to seeing more. Hello, just wanted to say I was anxious to do my kitchen cabinets and watched Christy’s video on painting kitchen cabinets. I too, was nervous so I did my masterbath vanity first. I followed her directions to the letter and my kitchen cabinets are fabulous. I am so glad I did it myself (with the help of a friend) instead of paying someone or buying already painted cabinets. Saved so much money. You’ll do a great job. It takes time and it is work; but well worth it in the end. 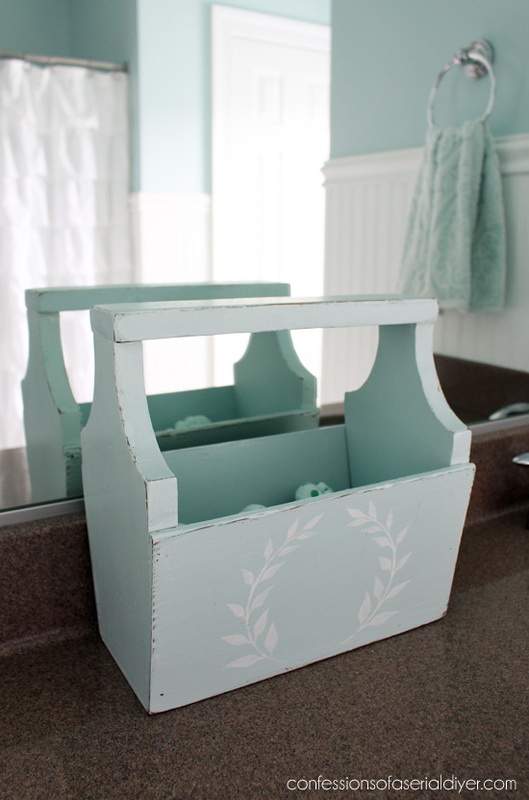 In this guest bath post the cute t.p. basket with the starfish and shell is linked to the instructions for the basket with the roses and chalkboard tag (which is also cute!) I was interested in seeing how you taped off the basket to create the wide stripe. Thanks! Gorgeous! Love that grout tip!! This was my first post to read of yours, and I was ready to be resistant, because I thought your bathroom looked pretty good in the “Before” photo. After reading your post, and how your painted instead of replaced the vanity, and were not at all extravagant, I totally changed my mind and joined your FB group! And I am very happy for the tip on how to clean grout without harsh chemicals. Thank you for an inspiring post! The bathroom looks wonderful. 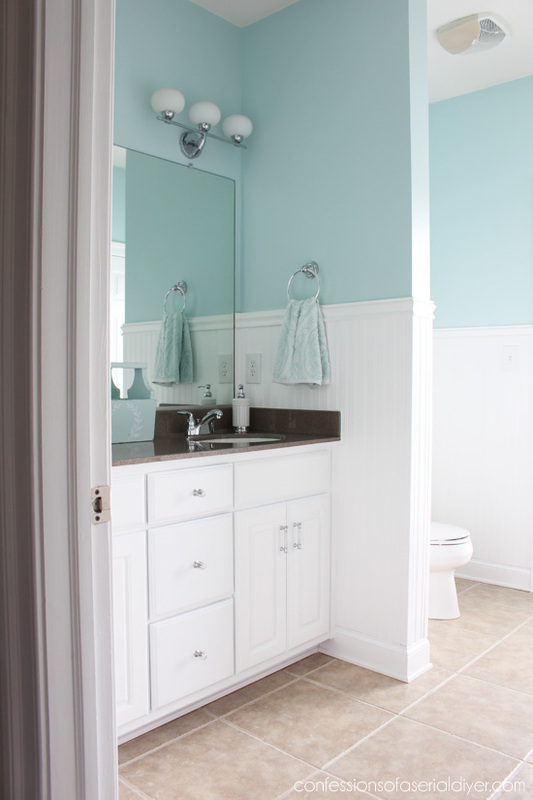 The bathroom looks amazing…..beautiful job. I love wainscoting, also. I would love to use it in my bathroom. Could you please do a tutorial on how you installed the wainscoting? Thanks! You did a great job, it really looks nice. 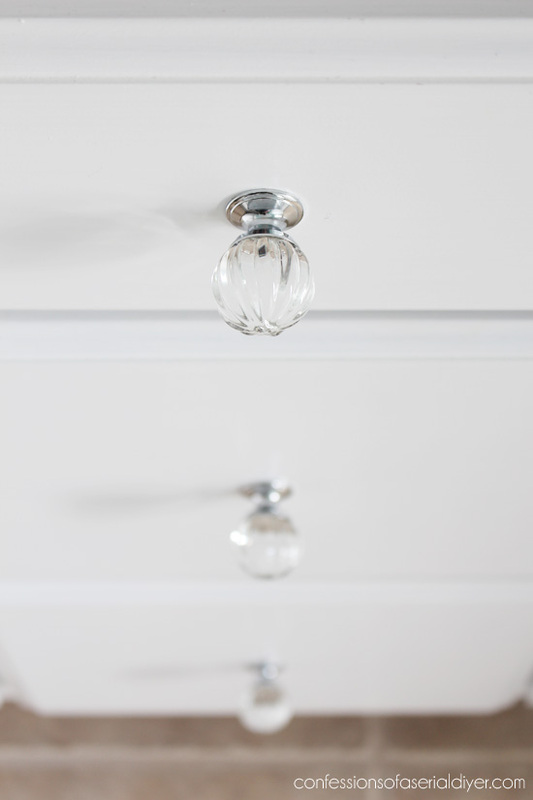 The two kinds of drawer pulls look really good together. Congratulations on finishing your guest bath- it’s lovely. And thank you for sharing the results of your labor with us. I would love to see the tutorial! Who knows, I might even get up the nerve to attempt another makeover! 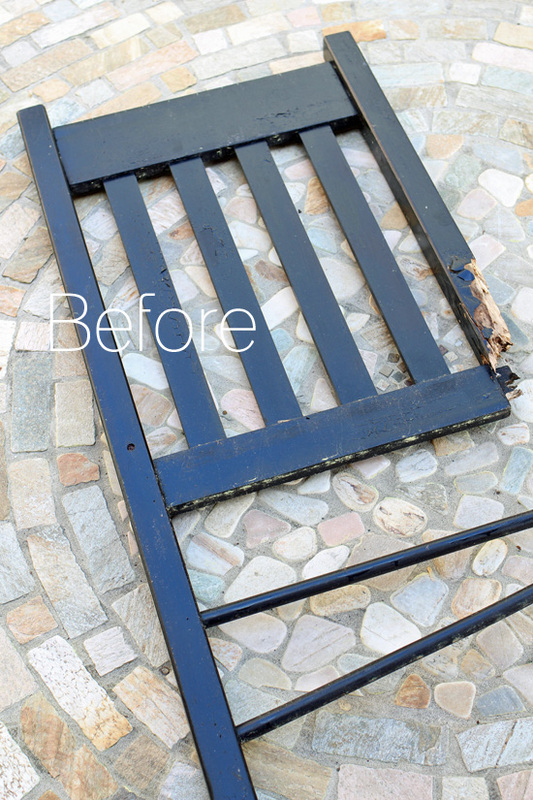 One of the best makeovers that meets my needs. I am so excited to learn about the grout cleaner and seal. Whew! Mine need it badly in the kitchen. admire your talents and your step-by-step approach to storytelling. I would really enjoy a tutorial on the wainscoting. You said it, fresh new look and beautiful! You have done a fantastic job, Christy. Beautiful job! I’m wondering about the wainscotting. How did you get it to fit around your vanity without having to remove the top? 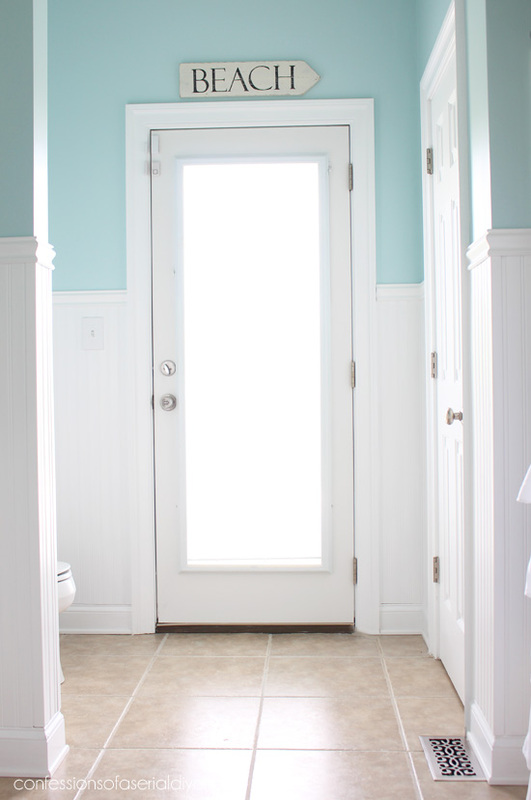 Did you also have to put in new baseboards and door trim? A wainscoting tutorial would be lovely. However, I have found here in Oregon, no one wants to work. Five handymen, my agreeing to their quote and not one ever came back. Six or 7 to make parrot toys and were very excited … until I asked for a simple sample… never heard from them again. I don’t have the equipment for this, but I would love to know how… just in case I find someone who actually wants to work. Oh no…that stinks! Will be glad to share…coming next week! The bathroom is beautiful, I love it. Have you considered framing the mirror (glued one to my giant bathroom mirror and I loved it)? 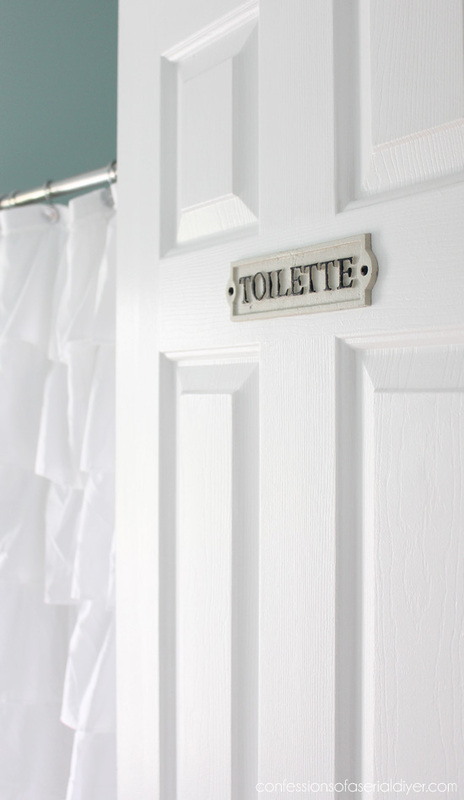 Love your new bathroom – the paint makes it feel so clean! I would love to see your tutorial ! This is PERFECT, Christy! Love the colors and the decor… just ‘right’! Love that pic that you took in the mirror, straight on the ‘tool box’. 🙂 Just love the wainscoting, too! 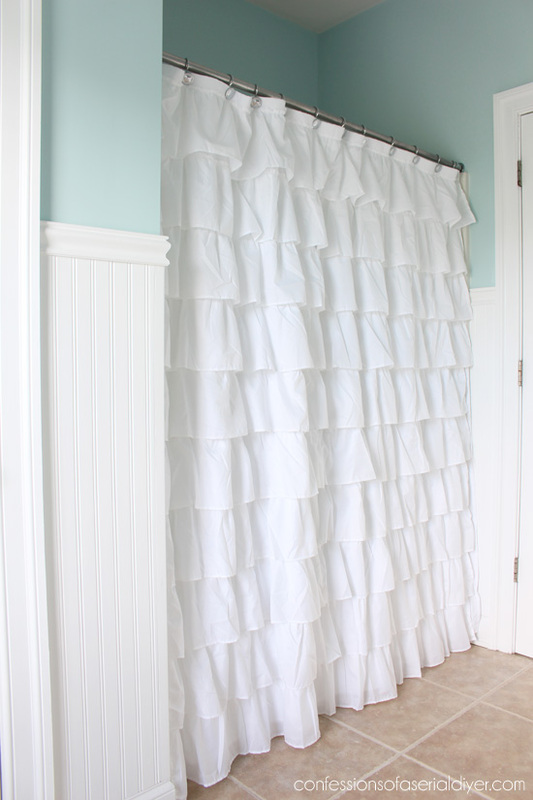 The shower curtain is just enough ‘frill’ for the space, too! The bathroom turned out great! Thank you for the grout tip! I have white tile with white grout in my bathroom and there are areas that I can’t get as clean as I’d like, so I am looking forward to giving this a try! 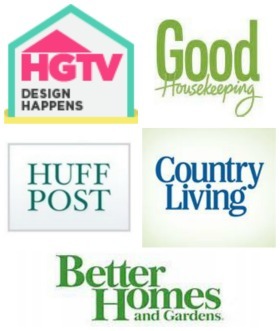 I personally would love to see the step by step wainscoting tutorial! So, please post it when you can! Wow, I can’t believe how that homemade grout cleaner worked! Good to know. 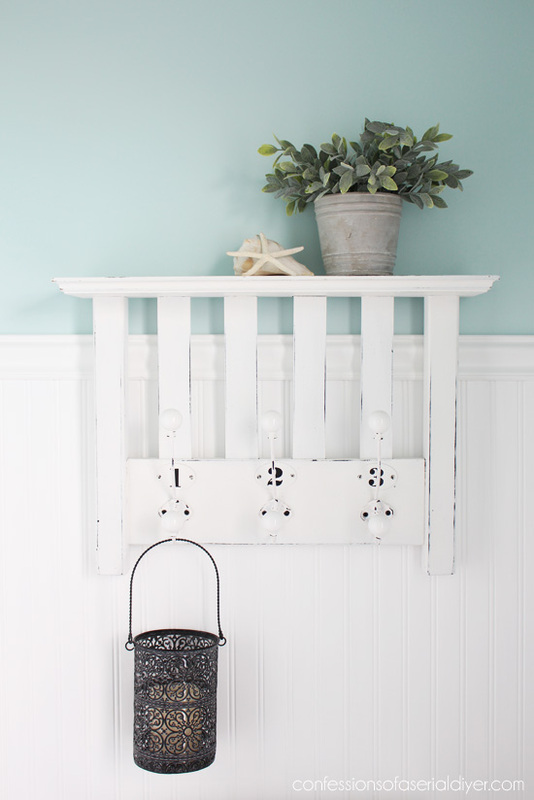 I would really like to see your pics or video of how you put up wainscoting. Looks fabulous by the way!! I love what you did in this space. Your guests are going to feel so loved! With all the other updates, you made the blah beige tile look like sand (now, sparkling sand!) in your beachy room. Really, no other floor would do! (I’m sure you thought of that.) Thank you so much for sharing yourself with us. I just fell in love…with your walls. Did you happen to create that tutorial? I’m definitely interested. WOW! My bathroom has gold tile in the shower and for a counter top. GOLD…TILE…(cringe). What made you use tongue in groove planks instead of the large sheets that are available? 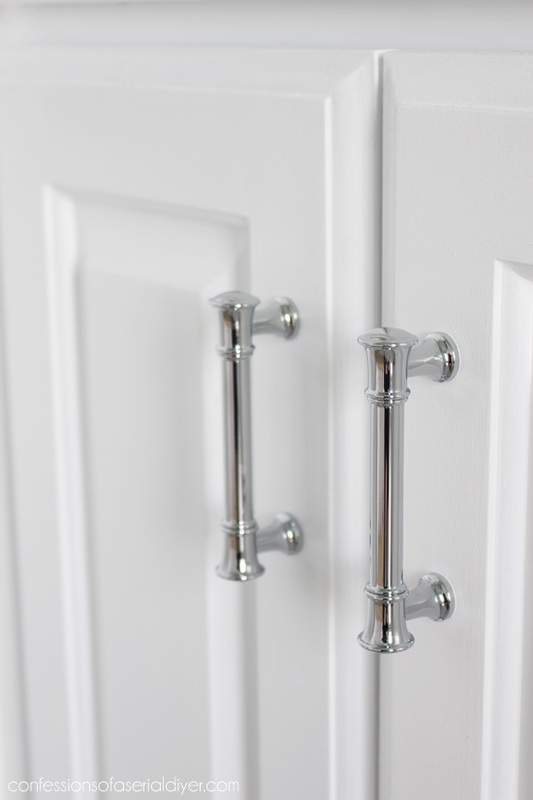 I have used these before on my kitchen island and like them. I used the sheets in my first house and they worked fine as well. I did like that I was working with 7″ pieces rather than a 4′ sheet at one time, made theme a bit easier to handle and install in a small space.